1. They are unpredictable, they may pretend to love you and then go in for the kill, or they may just go through you. Or they might even not try to kill you at all. 2. There is much more diversity in unicorn books. In some they are horrible killers, and in others they are sweet helpful creatures. Zombies are for the most part evil. 3. 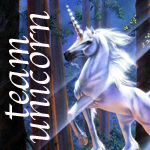 Rampant by Diana Peterfreund is a unicorn book and it rocks! 4. Unicorns are better looking by a long shot. I mean ripped clothing and pieces of flesh was so last year. Zombie lovers would you even ever like to see a zombie? I mean gross. 5. Unicorns can symbolize so many different things like eternal life ect. but zombies only represent death and destruction. 6. Zombies are so overdone. There are so many zombie books that it is hard to find a new idea. 7. Unicorns are just plain better. It started out as a comment but got super long, so I thought this would be easier.